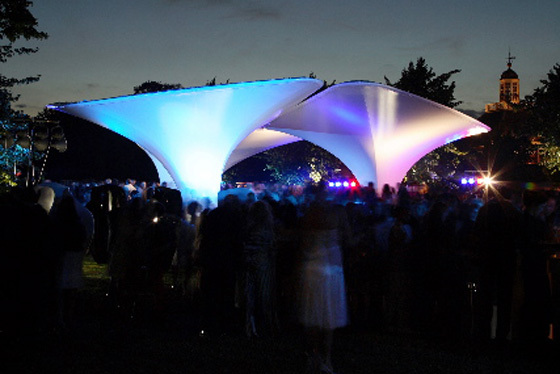 Three tensile fabric structures found a temporary home at the Serpentine Gallery’s outdoor Summer Party in London. Designed by Zaha Hadid with Patrik Schumacher, the architecture, entitled Lilas, stood nearly 20 feet high. The three identical structures were formed around a central point. Each was raised on a low platform and were completely free-standing in the space. 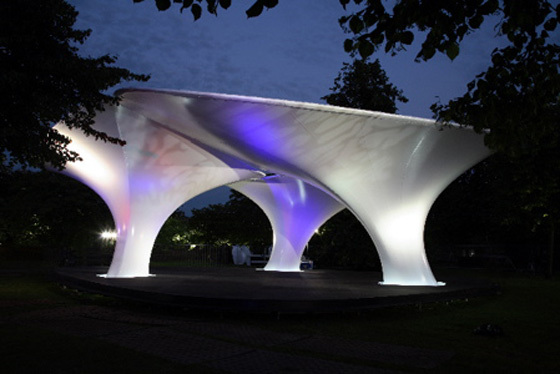 The architecture takes inspiration from complex natural geometries such as flower petals and leaves, the three parasols overlap to create the pavilion’s main conceptual feature: complex symmetry, interweaving all-the-while without touching, allowing air, light and sound to travel through narrow gaps in a state that is both open and likewise tending toward closure. Through the incorporation of lighting, the pavilion exudes an air of mystery. During the day, it provides shading from the sun. At night an energetic transformation takes place as the structures become a source of illumination. From continuous lighting around each base, light is thrown up the fabric surfaces along very thin seams that radiate about the parasols that act like corseting or the veining of flowers revealing the geometric intricacy of the pavilion and highlighting the overall architectural form in calligraphic arcs.